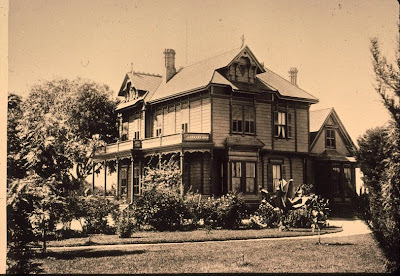 Last month's post concerned the 1858 brick home of Andrew Boyle, namesake of Boyle Heights. After Boyle's death in 1871, the house passed on to his daughter, Maria (pronounced Mariah) and her husband, William Henry Workman. Four years later, Workman subdivided much of the Boyle property and created the community of Boyle Heights. As the Workman family grew to include seven children, a new house was built very close to the older Boyle residence and was completed in 1887. This Queen Anne Victorian was part of the very popular style that was sweeping the United States. The home, as can be seen in the photograph, was a large one with the parlor, formal dining room, substantial second-floor bedrooms and other features typically found in the Queen Anne style house. A unique feature was that the wood frame wing which the Workmans added to the older Boyle House was removed from the latter and reattached to the former! It can be seen at the back of the house on the right. It turned out that, at the time the house was built, times were very good for Los Angeles, Boyle Heights, and for the Workmans. The completion of a direct transcontinental railroad line to the city in 1885 opened the floodgates of immigration. Tens of thousands of new residents, mainly from the Midwest and the East, poured into the city. Boyle Heights, with its proximity to downtown and views, proved to be a desirable place for the well-to-do to live. Boyle Avenue and other neighborhood streets were soon filled with large "Victorian" homes, some of which are still standing. In the case of the Workman residence, it remained in existence a relatively short time--about forty years or so. When the Workman family did what many wealthier families did by the 1920s and move to the Westside in newer neighborhoods like Hancock Park or Beverly Hills, their Boyle Heights property was sold to be part of the Jewish Home for the Aging. Unlike the Boyle house which was kept, the Workman home was torn down. Today, the site is part of the Keiro Senior HealthCare retirement facility for Japanese-Americans (a Los Angeles Times article about Boyle Heights and the Keiro facility, with brief mention of Andrew Boyle just appeared on Monday, 22 February—the day this post was drafted!) (See LA Times article here)The address for the Workman home was 357 South Boyle Avenue, at the northwest corner of the intersection of that thoroughfare with Fourth Street. The image below is a lithograph of the "Vineyard, Orange Orchard and Park of W. H. Workman, Boyle Heights" with an inset of the Boyle house that appeared in the History of Los Angeles County California, originally published by Thompson and West in 1880.